A day after NBC's Matt Lauer asked on Today, "why are there so many hurricanes this year and is global warming to blame?" and Robert Bazell ominously concluded an NBC Nightly News story by asserting that "many experts say" hurricane-fueling global warming "results partly from humans releasing greenhouse gases possibly creating even more violent storms in the future," ABC and CBS aired stories which largely dismissed global warming as a culprit. On Thursday's World News Tonight, ABC's Ned Potter featured a soundbite from National Hurricane Center Director Max Mayfield, who in little-reported congressional testimony Tuesday, discounted global warming as a factor. CBS's Russ Mitchell, on The Early Show, featured a scientist who "says hurricane activity comes in cycles that can last several decades. It seems Mother Nature has mood swings." Mitchell explained that "hurricane cycles are primarily driven by rainfall patterns in Africa and the Amazon basin." As for hype about hurricanes on the rise, Mitchell admonished: "The experts will tell us back in the '50s and '60s we saw some monster hurricanes, but we just have very short memories." 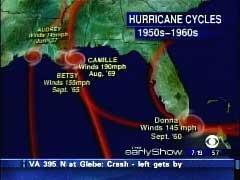 Full transcripts and CBS's 1950-'60s hurricane graphic follow. "Two hurricanes for the record books in less than a month. We're going to take 'A Closer Look' now at what might be causing this destructive weather pattern. A new analysis in the magazine Science shows monster hurricanes are on the rise. The number of category four and five storms off our shores has nearly doubled over the past 30 years." Ned Potter reported: "If warm water is what fuels a hurricane, the hurricanes this season have had extraordinary amounts of fuel. In recent weeks, the water temperatures in parts of the Gulf of Mexico have topped 90 degrees. That's helped make Katrina, and now Rita, into very powerful storms." Prof. Menas Kafatos, Center for Earth Observing: "The Gulf waters have been getting warmer. In fact, in this past August, 2005, we saw the highest temperatures in the Gulf of the last 25 years." Potter: "Menas Kafatos is a climate scientist at George Mason University. He says hurricanes build up strength from the steamy water below them. The warm vapor gives them energy, meaning faster winds. And the extra moisture means more rain, more flooding. Katrina and Rita started in the Atlantic, but became strongest once they entered the Gulf of Mexico." Kafatos: "It was the Gulf waters, which are appreciably warmer, that fed the two monsters and made them so strong." Potter: "But the earth's climate is wildly complex, and scientists say there are even larger forces at work. Over the last 30 years, two groups of researchers say while the number of storms has not been rising, their strength has." Prof. Peter Webster, Georgia Tech climatologist: "The total number of storms that are reaching category 4 and 5, and the number of days that they're staying as category 4 and 5, which has increased substantially." Potter: "Some researchers say we may be seeing global warming at work. Others say we're at the crest of a regular cycle, that hurricanes go up and down in number over a period that lasts for decades. They're not sure why. They say there was a quiet period going until about ten years ago." "Then in 1995, it's just like somebody threw a switch here. And we've had a lot more hurricanes, not a record number of major hurricanes, but close." Potter: "This hurricane season is already one of the very busiest in the last century, and it won't end for another month. Ned Potter, ABC News, New York." A Tuesday AP dispatch relayed: "Under questioning by members of the Senate Commerce subcommittee on disaster prevention and prediction, he shrugged off the notion that global warming played a role, saying instead it was a natural cycle in the Atlantic Ocean that fluctuates every 25 to 40 years." For the AP story. The MRC's Ken Shepherd caught Russ Mitchell's piece on Thursday's Early Show. Quad-host Julie Chen introduced his segment: "Just weeks after Hurricane Katrina savaged the Gulf Coast, another monster storm is on the way. That has plenty of people wondering what's going on? Are the number and strength of hurricanes on the rise? The Saturday Early Show's Russ Mitchell has some answers. Good morning, Russ." Mitchell, in studio with Chen: "Good morning to you, Julie. We are in fact seeing more hurricanes today than we did a decade or two ago, but for many folks it's no surprise. For years now, experts have been saying we've entered a period of increased hurricane activity that may last a long time." Doctor Gerry Bell, NOAA: "We're now in a very active hurricane era. Last year was very active, the year before that was very active. This active hurricane era began in 1995. Since 1995, nine of the last 11 hurricane seasons have been above normal." 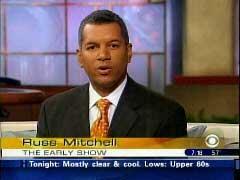 Mitchell, narrating taped segment: "Doctor Gerry Bell is a NOAA seasonal hurricane forecaster. He says hurricane activity comes in cycles that can last several decades. It seems Mother Nature has mood swings." Bell: "The previous active hurricane era was the 1950s and 1960s, and then we were pretty inactive for about a 25-year period from 1970 to 1994 and now we're back in an active hurricane era." Mitchell, over map showing dates and names of huge hurricanes in the 1950s and 1960s: "For example, in the '50s and '60s, the Gulf Coast was hit hard and often as storms like Audrey, Donna, Betsy, and Camille came ashore. In the 70s and 80s, that same region had only one major hurricane, Frederic. But since 1990, the number of big hurricanes in the Gulf is up again, and there's no end in sight." Bell: "We can expect continued high levels of hurricane activity and high levels of hurricane landfalls for the next decade or perhaps even longer." Mitchell: "Why? Bell says hurricane cycles are primarily driven by rainfall patterns in Africa and the Amazon basin." Bell: "Turns out that those rainfall patterns tend to last for 20 to 30 years at a time. As a result, so do the wind and pressure patterns over the Atlantic that control hurricane activity." Mitchell: "But there are other factors as well, like warm water, which hurricanes feed off. Sea surface temperatures have gone up but scientists point out those temperatures go through cycles as well, and right now, we're in a warm cycle. Still, many in the field believe global warming may at least be a contributing factor to increased temperatures." Michael Schlacter, Weather 2000 meteorologist: "The water temperature is quite essential to the strength of a hurricane. It actually only takes maybe two to four degrees fahrenheit to be the difference between able to support a Category III hurricane and a Category V hurricane. So whether it's global warming, the cycles, or just a hot summer, those little bit of increases in temperature can mean a big difference in how severe these storms are." Mitchell: "If I live in one of these areas that are susceptible to hurricanes, how concerned should I be in the next 10, 20 years?" Schlacter: "I would be very concerned. And as far as Americans love being near the beach, and as far as we have severe weather that's constantly threatening these coastlines, it's kind of a teeter totter that we'll be living with for some time." Mitchell, back live in studio with Chen: "Rita is the 17th named storm of the Atlantic hurricane season, making this the fourth busiest season on record, and Julie, the most active hurricane season ever was back in 1933." Chen: "So it's not like it's worse now?" Mitchell: "No, it seems that way. The experts will tell us back in the 50s and 60s we saw some monster hurricanes, but we just have very short memories. The bottom line is, as we said in the piece, Mother Nature is rather fickle, it has mood swings."